Windsor, Canada is growing at rates that hasn’t been seen in at least two decades. What is causing the growth at such drastic rates? Experts are saying that the lure of a strong economy, affordability, access to the U.S., immigration and secondary immigration from within Canada are the cause. From July, 2006 to July, 2009, the population decreased or remained the same for 36 consecutive months. It began to rebound in 2011, and the growth rate of the past 16 months is two to three times what the previous seven years produced. This growth is extremely important because it isn’t just retirees. It is also young families with lots of children. It looks to grow even more as the agricultural area expands as well as the residential areas. This growth is a great example of the hunter and the prey analogy that we spoke about in class. As the population grows, so does the work, but once the work is complete, then what happens to the population growth? Windsor saw this happen in the 80’s when the GM and Ford companies began a tremendous amount of expansion. I hope that Windsor learned from history so that it doesn’t see an even larger recession in the near future. 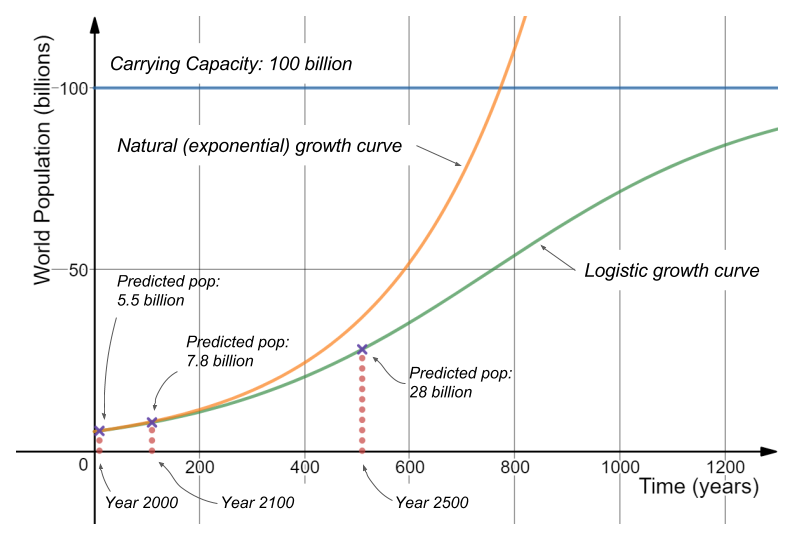 In exponential growth models, the rate of growth in a population never changes and is typically unrealistic. In the real world resources like food, for example, will run out if a population keeps growing exponentially. 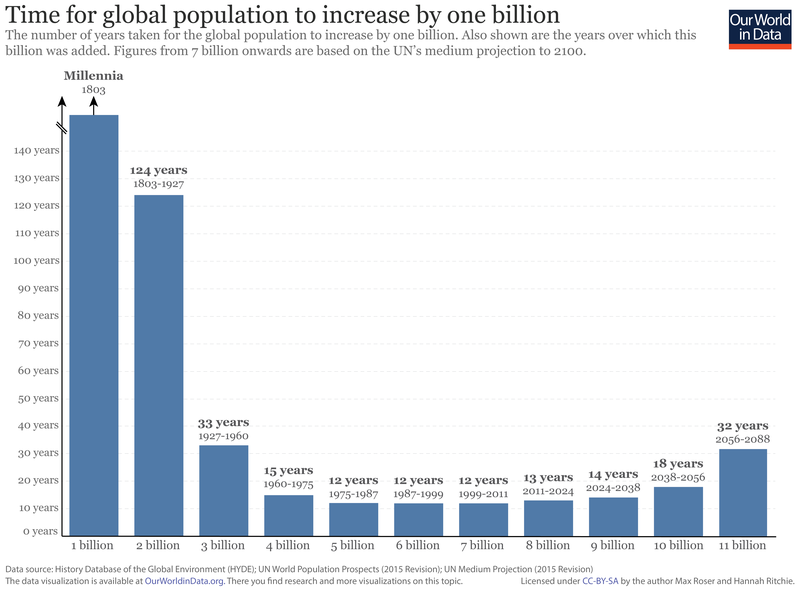 Thus a population will reach its carrying capacity. Carrying Capacity is the maximum number of individuals a population can support based on that population’s needs. As we discussed in class, the Rule of 70 is used to figure out how quickly something will double when it is growing exponentially. When you divide 70 by the percent increase the outcome is the doubling time. When you divide 70 by the doubling time the outcome is the growth. The Rule of 70 is often used to predict population growth but it has other uses as well. One of these other useful applications of the rule is estimating how long it would take a country’s real gross domestic product to double. Here you use the GDP growth rate in the divisor of the rule which is similar to calculating compound interest rates. For example, if the growth rate of Japan is 10%, the Rule of 70 predicts that it would take seven years for Japan’s real GDP to double. That being said, it is important to remember that the Rule of 70 is only an estimate based on forecasted growth rates. Therefore, if the rate of growth fluctuate then the original calculation may be inaccurate. Because of this, the Rule of 70 should not be used where growth rates are anticipated to vary dramatically. All of the coral reefs combined is less than 1% of the oceans environment but yet it is home to more than any environment that the ocean has to offer. Coral reefs has 25% of all marine life living in them about 2 million species. Compared to the rainforest that only have 10% of terrestrial animals. But within the last 30 years 50% of coral reefs have disappeared. People depend on the coral reefs for a multitude of things. 1/5 of protein consumed is from seafood. The coral reef fishery is a billion dollar industry. About one billion people eat fish as their main source of protein. 1/8 of the world’s population live near coral reefs. Even in medicine. 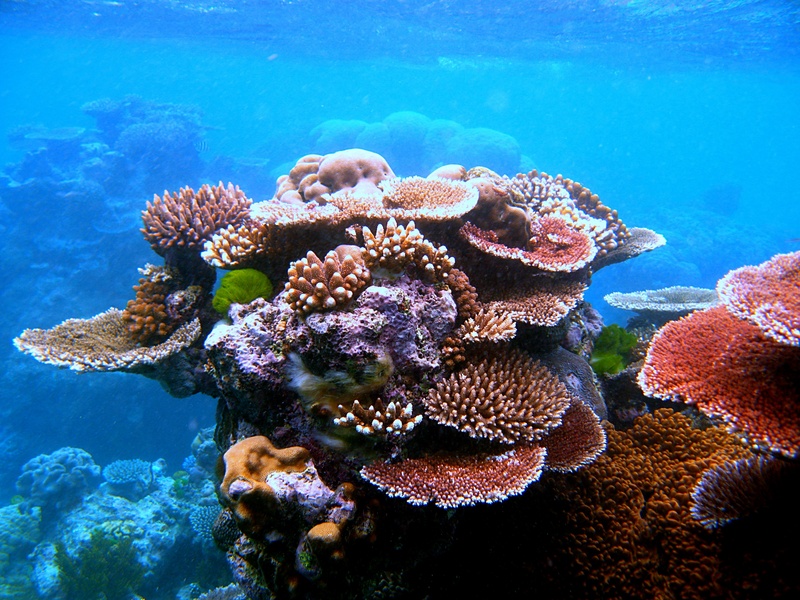 Scientist are 400% more likely to find new drugs in coral reefs. Treatments for cancer and HIV is found in coral reefs. Coral reefs is a big industry for tourism as it brings in 3 billion dollars in Florida alone. Coral reefs brings in 30 billion dollars each year. The population of humans on our planet went through an exponential growth spurt, beginning roughly at the start of the twentieth century. In the year 1900, the estimated global population was roughly 1.65 billion people. Only one hundred years later, and the population more than tripled to 6.2 billion – more people were alive at the start of the millennium than had ever existed previously. To put this into perspective, more people were born in the last one hundred years than had been born since the beginning of the earliest civilizations, five-thousand years ago. This exponential growth was short lived, however. 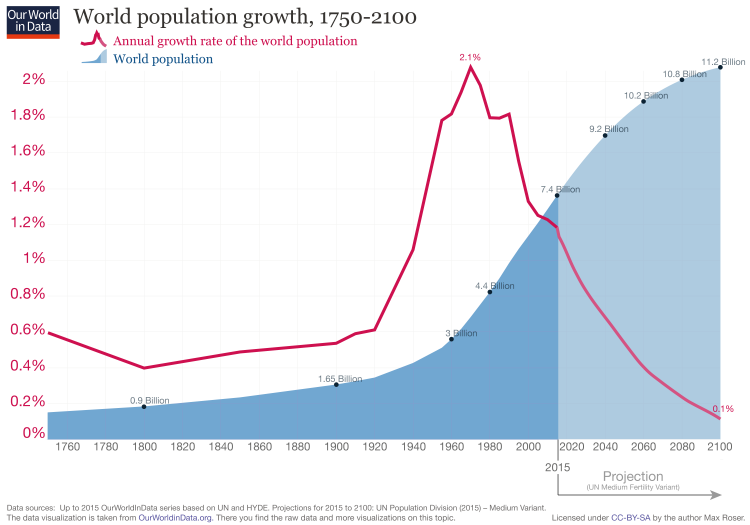 The global population growth rate peaked at ~2.1% per year in the mid 1970’s, and has subsequently begun to decline. This will likely continue until the growth rate reaches close to zero, which is estimated to happen shortly after the beginning of the next century. Every species has a carrying capacity. Will we reach ours by the year 2100 CE? That’s what many experts seem to believe. The exponential growth of purple loosestrife, an invasive flower introduced to North America around the 1800’s, is incredible. Multiplying quickly, purple loosestrife can max the carrying capacity of marshy and pond-like areas in the span of a year. According to Garden Know How, one plant produces approximately half a million seed a year. Purple loosestrife’s exponential rate of growth is amazing since its seeds have an extremely high germination rate, and it has no real limiting resources. Though purple loosestrife has no predators, the environment it takes over only has a certain amount of resources. This acts as the limiting factor. Unfortunately, since its only limiting factors are its environment, chemicals, and people, it continues to run rampant, destroying habitats for many kinds of wildlife. The golden ratio is a ratio of 1 to 1.618, and seems to be demonstrated a lot in nature (flower pedals, seed heads, pine cones, shells, hurricanes, etc.) This ratio is mathematically represented by the Fibonacci series (1, 1, 2, 3, 5, 8, 13) – each number being the sum of the two previous numbers. It also has been shown to be found in art and architecture. It seems that this ratio pleases the human eye, but the reason as to why it is so aesthetically pleasing to look at remains unknown. It is important to understand the difference between simple and compound interest. Two different equations, resulting in two different outcomes. Compounding interest is the common used methods and is mostly used with deposit accounts and/or loans. Simple interest is interest that reoccurs on your initial investment. For an example if you invested $5,000 at a rate of 3%, the first yea you will get back $150. Year two is $150, Year three is $150 and so on and so on. Compounding Interest works different. Let’s take that initial investment of $5,000 at a rate of 3%. The first year is similar with simple interest which resulted in $150. However after the first year is when everything changes. The second year 3% is not on $5,000, but $5,150 which equals out to $5,154. This is what we talked about in class when discussing exponential function. Although my example wasn’t as extreme as the grain of rice or bacteria in a bottle but with the compounding interest formula and my given data after 10 years it would calculate to $6,719.58 verse $6,500. $219.58 extra if you used compounding interest. I have never actually seen the movie Network, but what I have seen and have been very inspired by is the scene where the American public stood up, went to their windows, and screamed “im mad as hell, and im not gonna take it anymore!” This is how many may feel about the astronomical amount of debt our country has been accumulating. Like some of the issues our country has been facing, our national debt has been growing and there doesn’t seem to be any slowing down. But is there actually an argument to be made that it is growing exponentially? “We find it just a little confusing why the CBO never warned of an imminent “fiscal crisis” over the past 8 years when total US debt doubled, increasing by $10 trillion under the previous administration.” Writers at Zerohedge speculate after examining a 2017 report made by the Congressional Budget Office. This could have been forecast if you noticed the growth in the national debt as an average like above. Although it does not look perfectly exponentially, it is growing at a steady rate. Some others argue that our national debt is not exponentially growing. Tim Altom, a worker at IBM cloud and a writer on Quora, argues this. War and recessions make the argument that the debt would increase and decrease over those times. But it certainly paints the picture that our debt is certainly not exponential. If you look at average projections, it also does not look perfectly exponential, but it is steadily growing. Whether or not the growth is exponential depends on what graph you look at and what it contains. But one thing is for sure, although our national debt does not look to be perfectly exponentially growing, it is growing.